An aspiring actor in Salford battles his mates and family who would much rather see him stacking shelves at Tesco. Friendly and bright, he’s frustrated and wants to leave in search of opportunities, but frets about leaving the community that raised him – and a growing realisation that a change of scene may not temper the class and family issues he carries inside him. 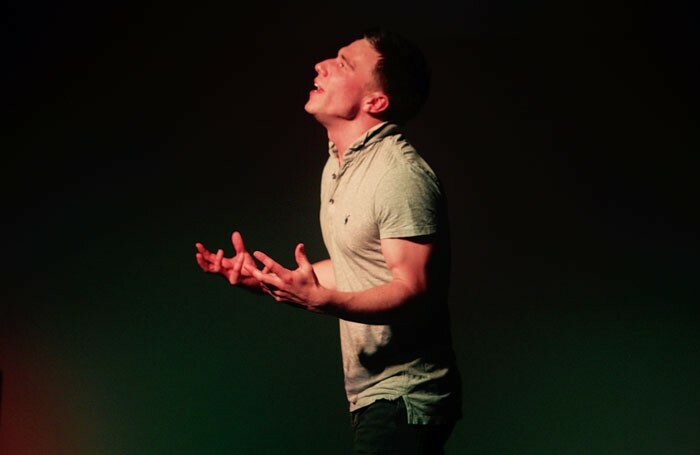 Written and performed by Tom Gill as an ambitious spoken-word musical, Growing Pains vividly documents a real topography and community that adds authenticity to images such as the hoodies congregating in the park and the memory of a girl run over on the busy main road. It’s a day in the life that flips through a series of encounters and observations that are as socially spot-on as they are bittersweet. His violent dad hauls him in over the phone bill, a green-fingered Jamaican neighbour encourages him to let his talent grow, while in London love stirs awkwardly along with social rage and failed auditions. In-between the rolling couplets, Gill’s songs don’t disappoint and range from angst-filled rap to Plan B ballads, while there’s a wicked piss-take on Broadway musicals as he pleads with a barmaid to serve his underage mates. Gill rejoices in the poetry of it, playing on the audience’s anticipation at an intentionally obvious rhyme or crammed couplet while taking the cue from the metre to build on the physicality of the delivery and even structure of the play. It allows him to use the whole stage to sustain a high-energy performance, while still offering highs and lows in tone. Handily, he also effortlessly shifts gear between the spoken, rapped and sung passages.